Our health depends upon the food we eat. But unfortunately, our farmers are using hybrid seeds, chemical fertilizers , poisonous insecticides, weedicides and other type of chemicals to get better yield. Then additional toxic chemicals to improve colour and shelf life are added. All this is very costly in terms of money, health and environment and is the cause of serious diseases like cancer, diabetes, hypertension, thyroid, blood related and lifestyle diseases. 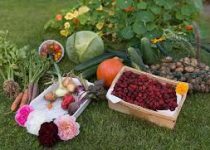 Our Natural Gardening Course has been designed with the aim to grow food in your own home, society gardens, pots, terrace, balconies or rooms, which is full of sattva (positive energy)to detoxify the body and mind and avoid long term sickness. The main objective of having a natural garden is to have uninterrupted supply of free organic vegetables, and purify your environment. Training of how to use the medicinal or natural herbs that we grow, or what generally grows in building gardens but people do not know how and what to use, to use them as medicines, herbal drinks, in food or as refreshing cooling drinks. A workshop of the same. Home and herbal remedies for Health and good nutrition. How to manage your waste for use in your kitchen garden. How to prepare garbage enzymes at home, and much more. Let’s come together to learn the art of growing our own food with best practices in small spaces. This is a government certified course and certificates will be given to all participants. Contribution: Rs 4000 per person.